Education • Rep. Dan McCay delivers unique civics lesson. 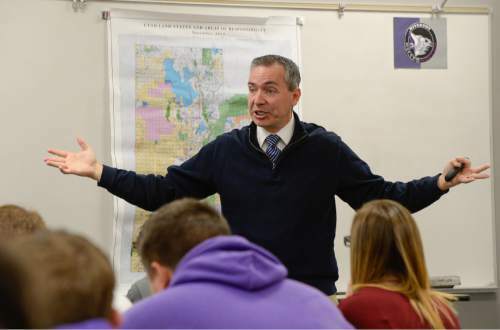 Francisco Kjolseth | The Salt Lake Tribune Students at Riverton High School get a firsthand lesson in the legislative process as State Representative Dan McCay steps in to teach Cliff Streiby's U.S. Government class on Jan. 20. McCay figured students could benefit from his experience and learn about the upcoming legislative session, which begins on Monday. 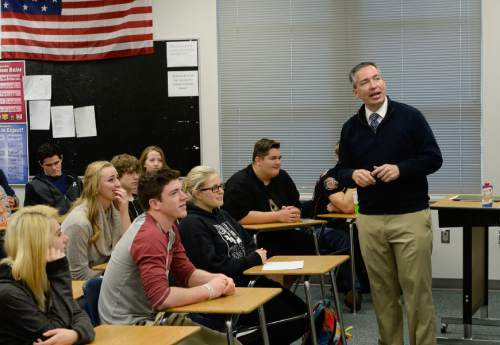 Francisco Kjolseth | The Salt Lake Tribune Students at Riverton High School get a firsthand lesson in the legislative process as State Representative Dan McCay steps in to teach Cliff Streiby's U.S. Government class on Jan. 20. McCay figured students could benefit from his experience and learn about the upcoming legislative session, which begins on Monday. Francisco Kjolseth | The Salt Lake Tribune Students at Riverton High School get a firsthand lesson in the legislative process as State Representative Dan McCay steps in to teach Cliff Streiby's U.S. Government class on Jan. 20. McCay figured students could benefit from his experience and learn about the upcoming legislative session, which begins on Monday. 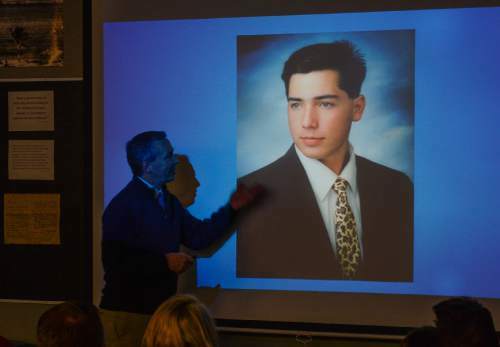 Francisco Kjolseth | The Salt Lake Tribune Students at Riverton High School get a firsthand lesson in the legislative process as State Representative Dan McCay tries to lighten the mood with a high school picture of himself while teaching Cliff Streiby's U.S. Government class on Jan. 20. McCay figured students could benefit from his experience and learn about the upcoming legislative session, which begins on Monday. 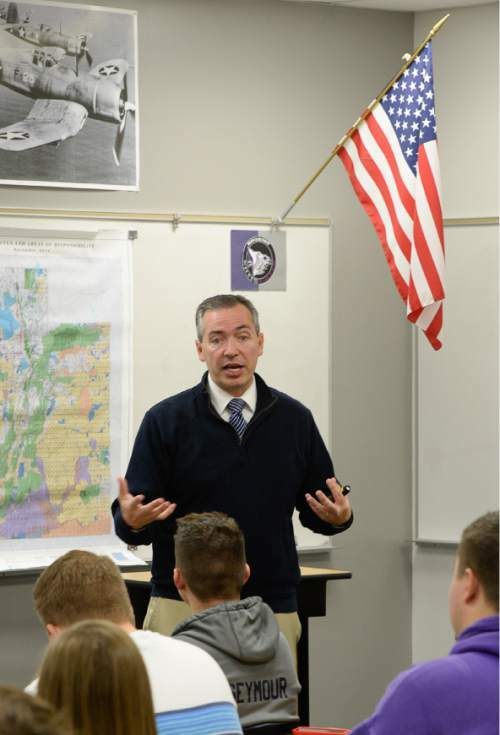 Francisco Kjolseth | The Salt Lake Tribune Students at Riverton High School get a firsthand lesson in the legislative process as State Representative Dan McCay steps in to teach Cliff Streiby's U.S. Government class. McCay figured students could benefit from his experience and learn about the upcoming legislative session, which begins on Monday. 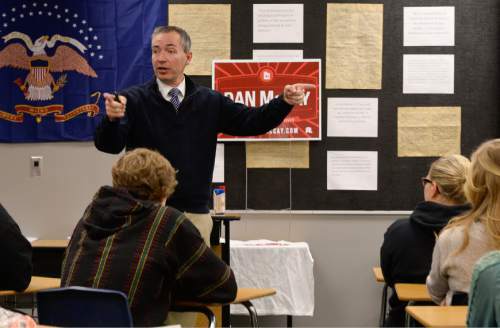 Francisco Kjolseth | The Salt Lake Tribune Students at Riverton High School get a firsthand lesson in the legislative process as State Representative Dan McCay steps in to teach Cliff Streiby's U.S. Government class on Jan. 20. McCay figured students could benefit from his experience and learn about the upcoming legislative session, which begins on Monday. Riverton • Students in Cliff Streiby&apos;s U.S. government class at Riverton High support mandatory safety inspections for Utah car owners. Or they did, before they were lobbied Wednesday by Riverton Republican Rep. Dan McCay. McCay taught two U.S. government classes at the high school this week, during which he talked about Utah&apos;s legislative process and polled students attitudes on various topics. While Wednesday&apos;s students maintained their support for DUI checkpoints, divorce-orientation classes and concealed-carry permits, McCay&apos;s arguments about the inefficacy of safety inspections swung the majority on a second vote. "We&apos;re teenagers," Riverton High senior Tanner Seymour said. "We&apos;re impressionable." McCay, who studied education at Utah State University before earning a law degree, was often in the minority opinion as students, using the messaging apps on their cellphones, voted yea or nay to the bills he presented. He said validating his views was less important than showing the students that every bill and policy position has nuance. "These guys are the ones who are going to be making the decisions in the near future," McCay said. "I want them to recognize there&apos;s multiple sides to issues and you have to be able to see those perspectives." McCay was first elected during a special 2012 election to replace Carl Wimmer, who resigned from the House to pursue a bid for U.S. Congress. McCay said that before his election, he had never visited the Utah Capitol, but had always been interested in politics. "I read the paper, I listened to the news," he said. "I did all those things, and my peers thought I was a dork." He described the 45-day legislative session to students as a "long slog" and commented on his reputation for casting the most opposing votes of any Utah lawmaker. That voting record, which has earned him the nickname "McNay," are buoyed by his default opposition to nonbinding resolutions, McCay said. "A resolution is terrible," he said. "A resolution is something people use to waste time." Alexis Averett, a Riverton High student, said she appreciated the chance to hear from an elected official who represents her community. She said it was interesting that on most of the policies McCay discussed, his views contrasted with the majority of those in class. "I wonder if that&apos;s just because we&apos;re young," she said, "or grew up differently." Averett also said McCay&apos;s firsthand description of the life of a lawmaker was less than appealing. "As much as I enjoy arguing," she said, "I don&apos;t think I would enjoy doing it every day. It would get exhausting."